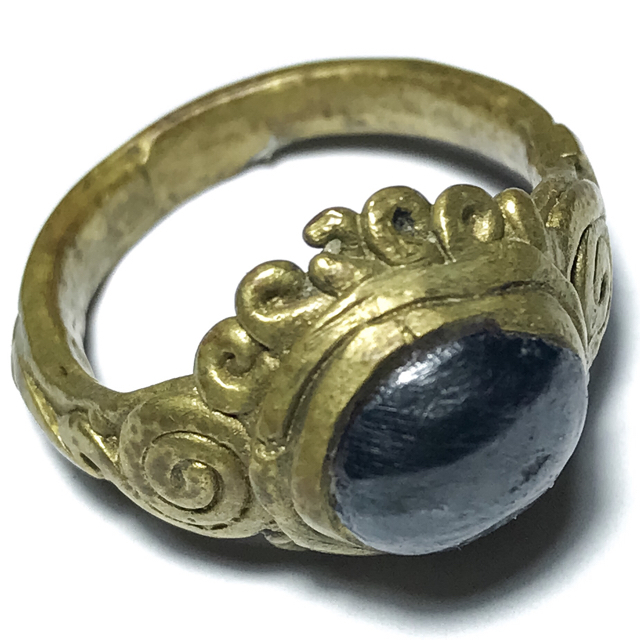 A Prustine example of the Hwaen Maekapat Alchemical Kaya Siddhi Ring of Protection and Wealth, from Luang Por Im, of Wat Hua Khao, measuring 2.0 Cm Inner Diameter. Luang Por Im was an olden days Guru Master, born over 150 Years ago, in 2406 BE, and who passed away more than 70 years ago in 2480 BE. Forged using ancient alchemical formulas of metallurgy and empowered with the incantations of the ancient sorcery grimoires of the lineage of Luang Por Im, the Hwaen Hua Maekapat is a famously powerful ancient amulet of high repute.